Dents in your vehicle are inevitable. Try as you may, one day you are going to go into a store, or or into work there is no way to keep your vehicle completely dent free. Enter Dynamic Dent Auto Hail Solutions. We are your go to repair shop for any and every kind of dent. 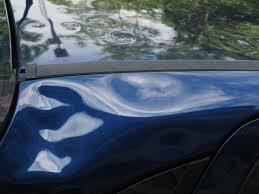 But what are the most common causes of dents to your vehicle? Often times shoppers just leave their shopping cart in the parking lot instead of taking the time to return it to the proper location. The wind, especially in North Texas, can blow a shopping cart right into a vehicle, leaving a dent. Your vehicle is never safe from a “sports injury”. Parents throwing a ball with their children, teams practicing, or a couple of kids playing together can easily result in a dent to your vehicle. All it takes it one bad throw or kick, and you may have a dent that needs to be repaired. While you are parked and at your location someone can easily park next to you, open their door rather quickly, and dent your vehicle before they realize it. Automatic car washes are a great convenience, however, you may pay for that convenience with dents to your vehicle. Bumps can happen while your vehicle is on the conveyor, and unfortunately that may lead to dents. Unfortunately, you can be your own worst enemy when it comes to dents. If you are a distracted driver you can easily dent your vehicle by pulling up to far in a parking space, parking too close to a curb, or taking a speed bump too quickly. No matter the reason, or how the dent occurred, our team at Dynamic Dent Auto Hail Solutions in Lewisville, Texas, offers premiere service, made simple and convenient, with a 100% satisfaction guarantee, and lifetime warranty on all repairs. Contact us today to get started on your vehicle’s repairs!